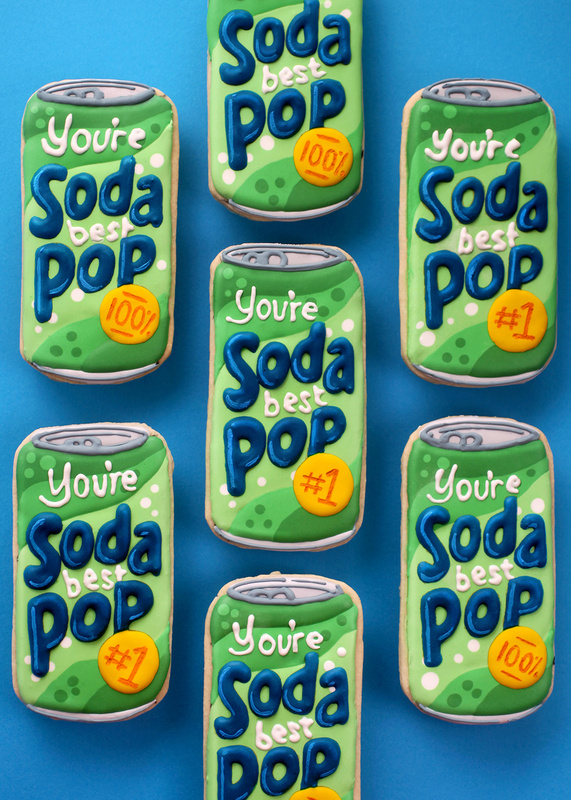 Hey Pop – you’re da best! 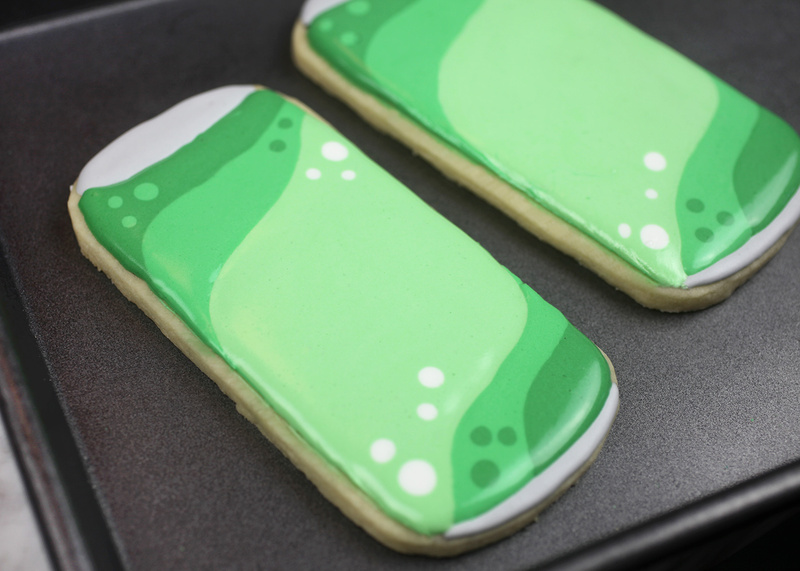 Enjoy these refreshing cookies for Father’s Day! 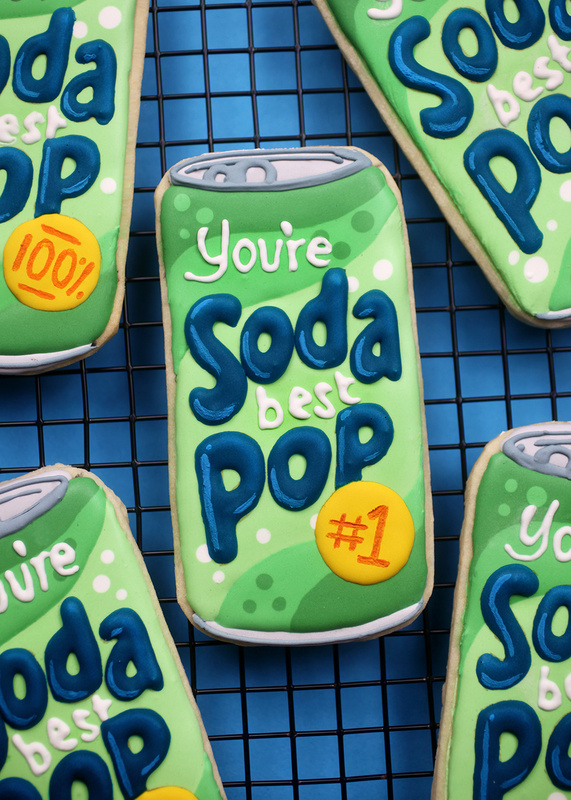 They’re jumbo sugar cookies decorated with royal icing and they’re a fun way to tell Dad he’s the best pop around. First off make some cookie dough. I used this Sugar Cookie Recipe from Bake at 350. It’s a keeper and I use it whenever I make sugar cookies. 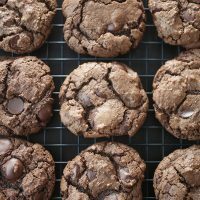 The recipe makes 9 of these jumbo cookies. Ten if you rolled them a little thinner. I used this awesome rolling pin to roll out the cookie dough. A new fave I recently bought from Food52. It rolls perfectly even, quarter-inch-thick cookies. I have always used a rolling pin and added those thick rubber bands on the ends to help keep my cookie thicknesses the same, but this one is much more convenient and I love it so far. 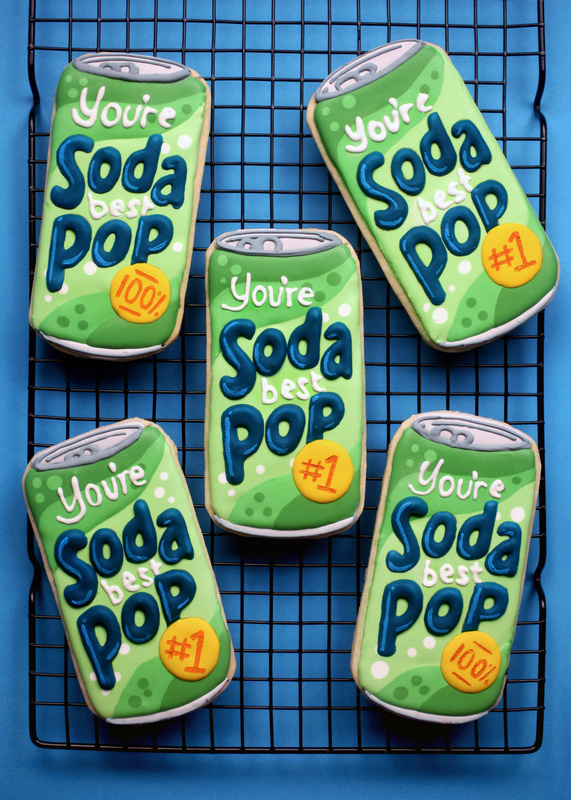 Now, I’ll admit that these cookies are not the quickest to make because of the multiple colors and drying time needed, but I couldn’t resist trying to make them after this soda pop pun popped in my head. 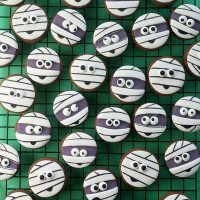 If you’re a cookie decorating pro, they’ll probably be a breeze for you, though. I’m not, so I made a template for my idea to make the decorating easier. I highly recommend downloading this template for yourself if you decide to give them a go. 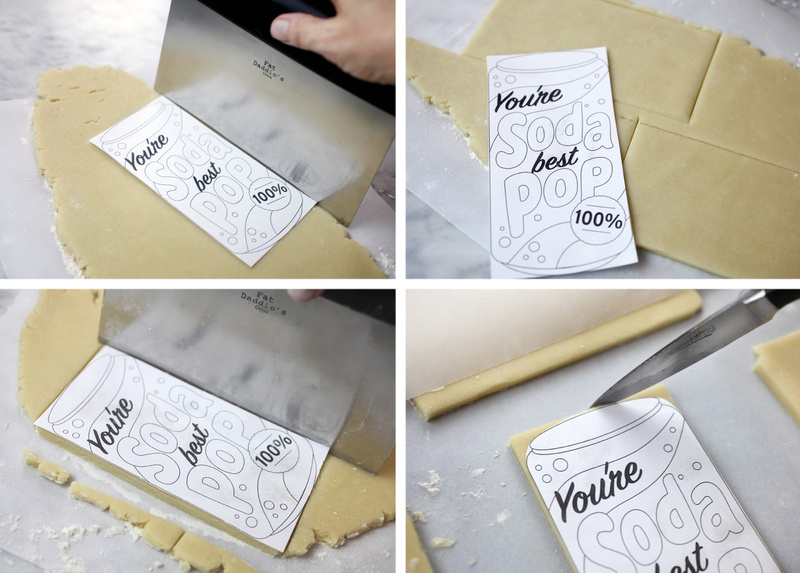 Cut out the soda can from the paper template with scissors. Roll out cookie dough and use a straight edge to cut the dough into rectangular shapes based on the size of the template. 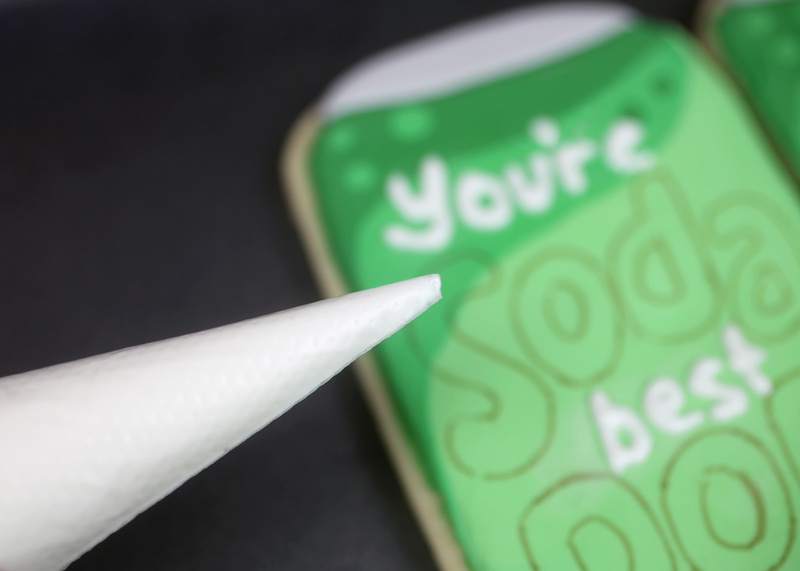 Then cut out the corners of the can from the paper template and use a knife to cut the same corners off from the dough. I always roll my dough on lightly floured parchment paper so I can easily transfer the cookie cut outs to a baking sheet when they are ready to go in the oven. 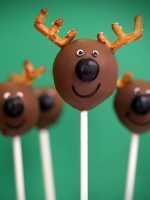 Bake them at 350 degrees Fahrenheit for about 15 minutes and let cool completely. Now for the next step. I used the same template and cut it into sections to use as a piping guide. 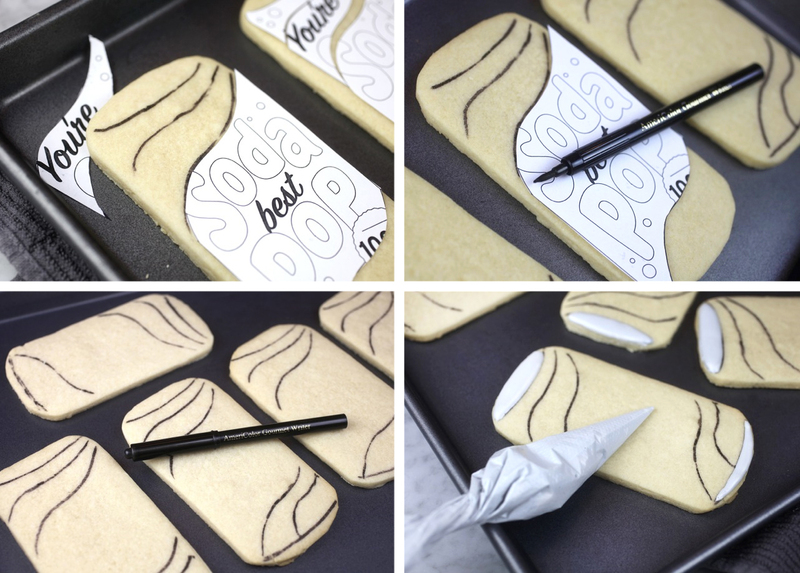 Just trace each section on the cookie with a black edible ink pen. This was super helpful for me because there is no way I could have gotten them all to look similar without it. 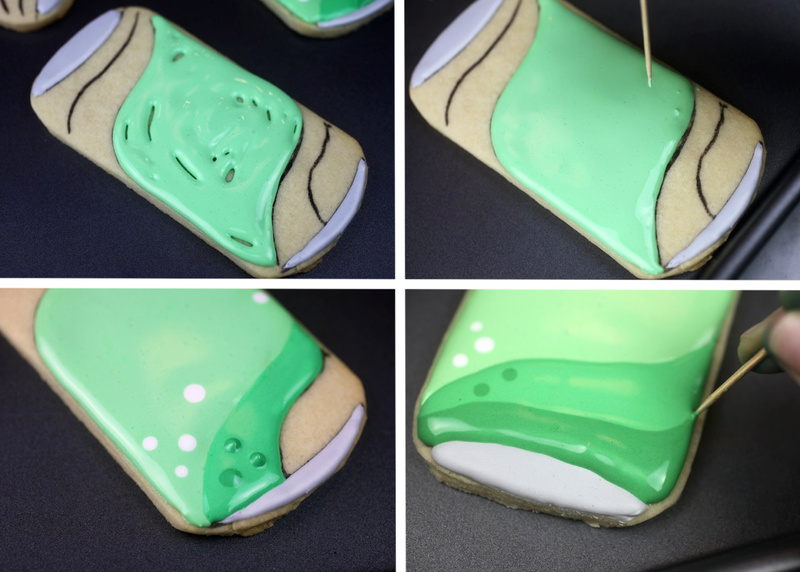 Now, you’ll need some royal icing. 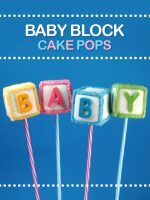 You can use the same recipe from here. I left some of the icing white, tinted some gray and then tinted three shades of green to get started. If you’re careful and good at cookie icing planning, you can get all the colors you need out of one batch of icing. 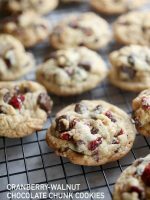 These cookies really need to be made over two days, so you can also just make a second batch for the remaining colors when you’re ready …especially if you’re like me and not good at judging how much of each color you’ll need. Okay, first I piped the lid and bottom of the can using tinted gray royal icing. Toothpicks are super handy. 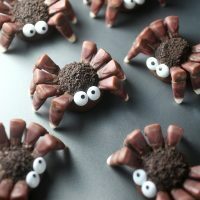 I used them to even out the icing where there were empty spaces and also to help create pointed ends. Just gently pull it through the icing as shown in the last picture above. Now let dry. Dry. Dry. Dry. I would recommend drying overnight. Now, we’re on to day two. I used white icing and tinted blue, yellow icing and more gray icing to finish the cans. For the words, I used the same template and cut out the word soda as one piece and the word pop with the circle badge as a second piece. 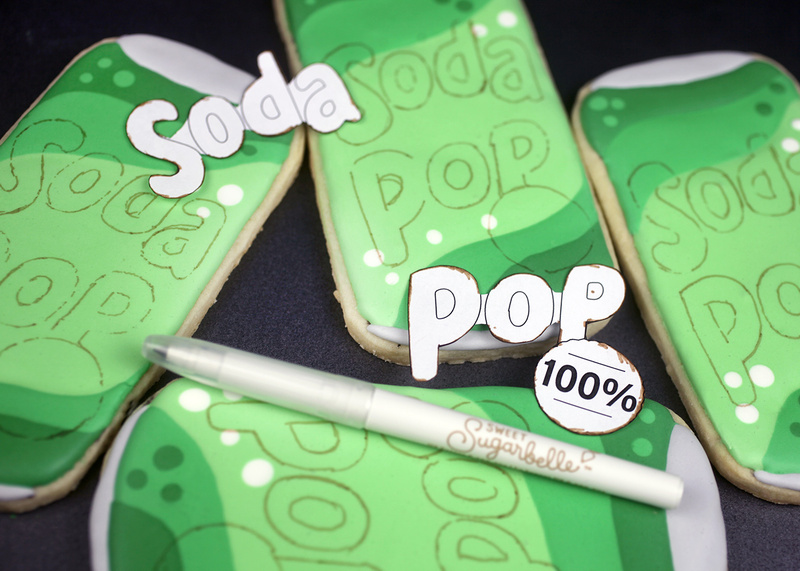 Then I could easily place each word in position and trace right on top of the cookie with an edible ink-writing pen. I used Sweet Sugarbelle’s pens here because they have a really thin tip. You’re best … I tried to do mine to pipe these words around the other letters. I made the blue icing with a thicker consistency so it would not spread, but would also not need to be outlined. Because that would have been a disaster. Pipe inside the lines and then tint some icing yellow and pipe inside the circle. 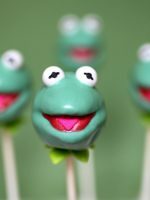 Outline the lid with more gray royal icing and let everything dry. 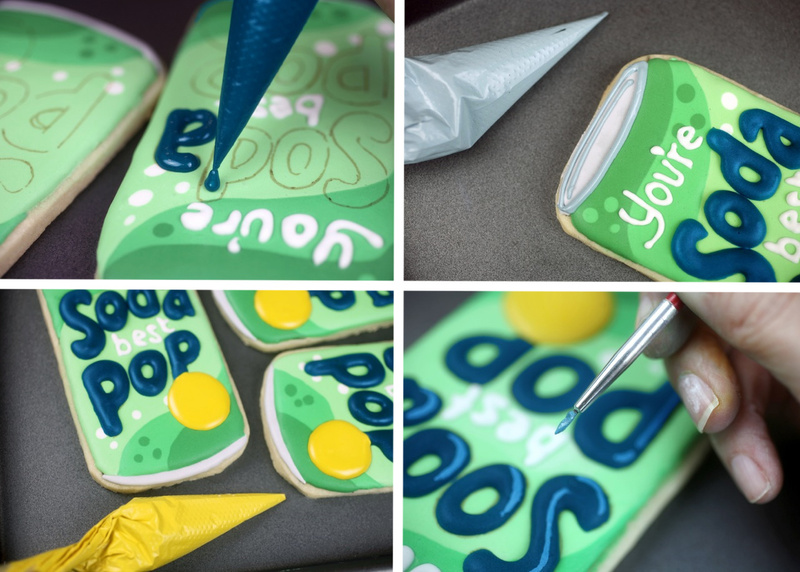 When dry, I added a little highlight detail to the big letters by lightening the remaining blue royal icing with white icing color and using a small paintbrush to gently paint highlights on the letters. For the final touch I used an orange edible ink-writing pen to write inside the circles because after piping the white letters I knew I wouldn’t be able to make them look straight enough. The pens are much easier to control and you could even use them for the other small words if you want. Here’s the color assortment for reference. You’re so da best Pop!!! Enjoy and Happy Father’s Day to all the dads out there! 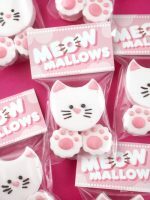 These are adorable and my husband would love these! Thank you for sharing such creativity and talents with us! Oh my goodness your talent and patience are simply unbelievable! Great Job! Base on your idea, i made coke support my football team (Germany) in this world cup!!! This is impressive! I love all the detail. 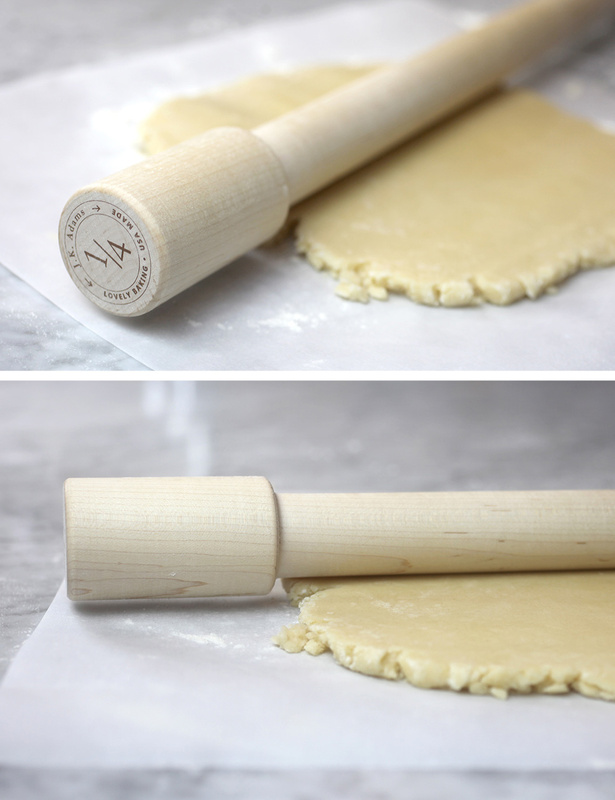 Thank you for the rolling pin tip – I think I need one now! 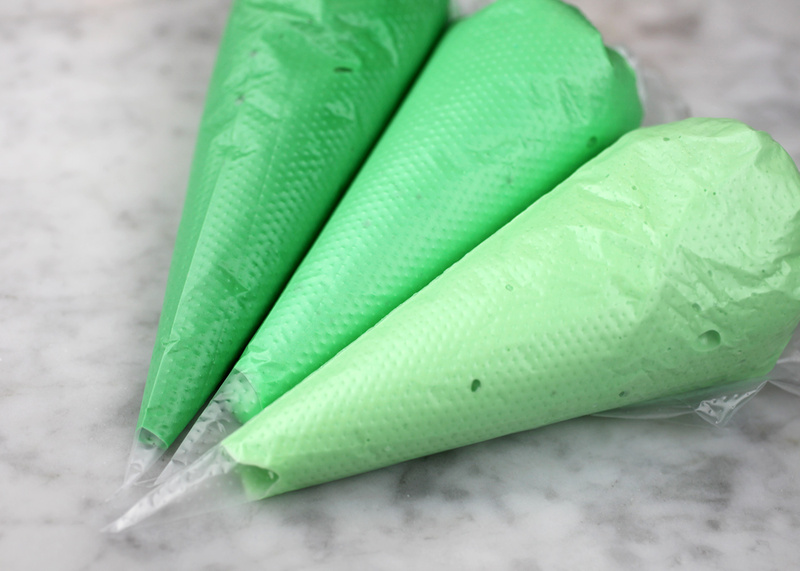 What brand of tipless icing bags do you use? 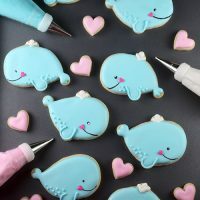 These cookies are whale cute!